I'm no expert..but awhile back there were a few binding tutorials. 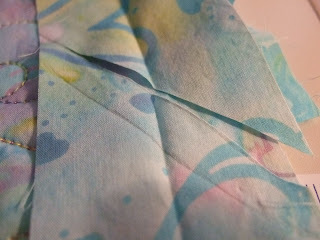 After binding a few times in class, I started doing mine this way. 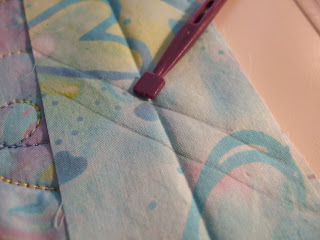 I assume that you sew your strips together on the diagonal..so if you don't, and want to see how to do that, let me know. I will be glad to show that as well. I start with a 2 inch strip. Most patterns tell you to cut them 2 1/4". If that is your preference : go for it! I like the look of a smaller binding..and it works for ME. 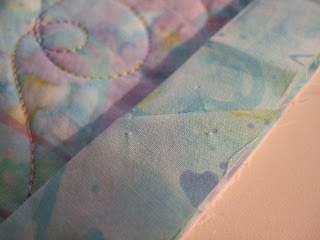 (you need to find what works for YOU) I only use bias if I have curved edges anywhere on the quilt. I use bias so seldom, I have to go back to a book for instructions when I do! Iron it in half, widthwise, wrong sides together. 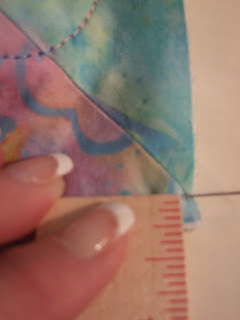 Leaving about 10 inches free, sew along one edge until you get a couple of inches from the corner. Put a pin 1/4 inch from the bottom edge. 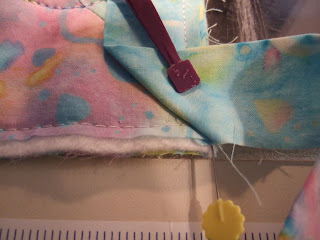 Sew down JUST to this pin...back stitch just a couple of stitches and then remove from under the presser foot. Fold the binding back 45 degrees. See how it slants JUST to the point of the corner? Now fold it back on itself, leaving that 45 degree angle fold in place. 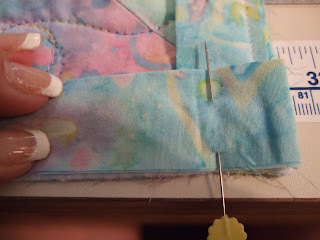 Turn the quilt and sew your quarter inch starting at the corner. 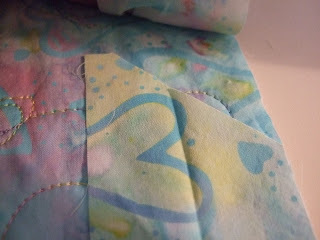 Continue around the quilt, mitering at each corner as you go. Stop sewing about 10-15 inches from where you started. Unfold your starting strip. This one is cut on the diagonal because I join mine that way. 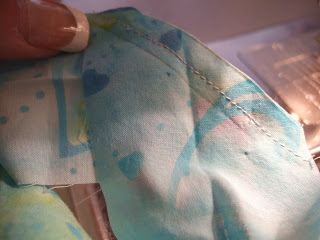 I find that the bias seam is less bulky. Personal preference. Unfold the ending strip. Lay a bias edge on TOP. This can be the starting end OR the ending end. You are just looking for a fairly accurate diagonal. 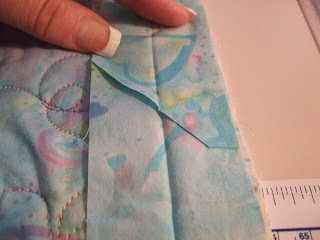 Now all you have to do is finger press that seam to one side or the other and complete the 1/4 inch seam! Pat yourself on the back! 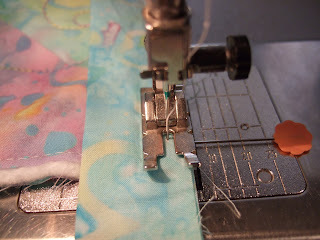 Tomorrow I will show you how I sew the back (if you are looking for a totally machine application : STOP right there! 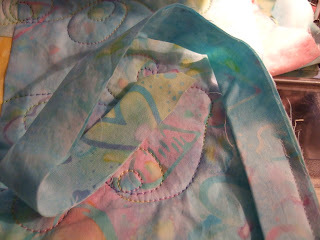 I do the back of my binding by hand. I will show you how I do the miters on the back...see you tomorrow! That is essentially how I do it but without the pins. I use the markings on the pressure foot to tell me when I'm 1/4" away from the end. See them there in the picture of your pressure foot? Lazy, but it works for me. Thanks for the nice comment about Grandma! She does look happy, doesn't she? Hey, I joined your Yahoo group or it's pending anyway. Love the quilt at the bottom! IT's great! And thanks for the tutorial! 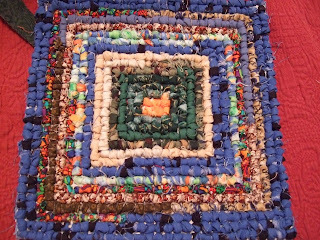 Wish I had seen it before I did the scout quilt!